Until it closed and was demolished early in the 21st century, McCorquodales was a “confidential” printing works over the road from the Wolverton railway works. It provided employment for the railway workers’ wives and daughters. 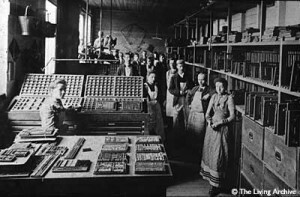 When war broke out, printing became a vital weapon with a huge official demand for ration books, posters, leaflets, enlistment orders and hundreds of military forms – the chances are that some of the government and military forms shown elsewhere on this site were printed there. McCorquodales had large government contracts which increased in war time – the company’s profits rose. Most of McCorquodale’s 800 workers were women – but supervision and management remained in the hands of men. With their husbands away at war, many women had control of the family purse for the first time and became more aware of differences in the way men and women were paid. 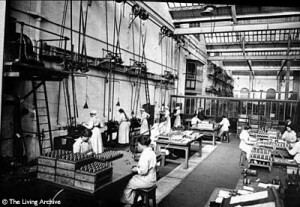 “The work girls and men at Messrs McCorquodale’s works were locked out on Thursday the 20th May, in consequence of a demand for a war bonus which it was alleged had been given to some of the men. Some 800 to 900 workers have been affected. Negotiations between employers and employees failed to bring about a settlement satisfactory to both sides and on Wednesday morning when the works were re-opened only about 50 workers entered the factory”. The strike lasted for more than two weeks. 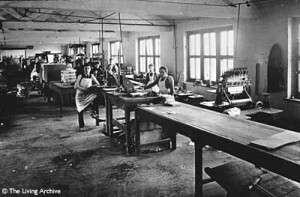 Five hundred of the women workers joined the Paper Workers Union. 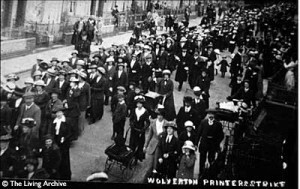 The women’s action in support of their demand for both a war bonus and recognition of the Union, involved pickets, parades, collections and meetings. A government enquiry was carried out by Sir George Askwith, the Chief Industrial Commissioner. As a result of Askwith’s assurances some girls returned to work. But their terms were not met and many of the girls were given different work. They rejoined the strike. The women eventually succeeded in securing a 7.5% increase in their weekly earnings as ‘war wages’. There were several other women’s protests about war bonuses around the country at this time. They were motivated not just by a sense of injustice, but by the pressure of a rapidly rising cost of living.